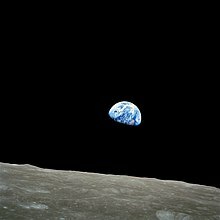 Landing men on the Moon by the end of 1969 required the most sudden burst of technological creativity, and the largest commitment of resources ($25 billion; $107 billion in 2016 dollars) ever made by any nation in peacetime. 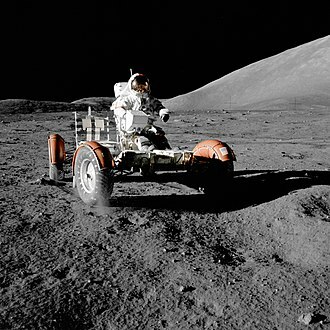 At its peak, the Apollo program employed 400,000 people and required the support of over 20,000 industrial firms and universities. 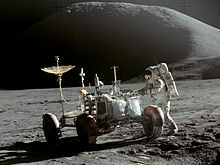 The final cost of Apollo was reported to Congress as $25.4 billion in 1973, It took up the majority of NASA's budget while it was being developed. For example, in 1966 it accounted for about 60 percent of NASA's total $5.2 billion budget. That was one of the biggest investment of the US in science, research and development, and employed thousands of American scientists. 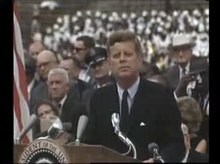 A single Saturn V launch in 1969 cost up to $375 million, compared to the National Science Foundation's fiscal year 1970 budget of $440 million. ^ a b c d Thomas, Ryland; Williamson, Samuel H. (2018). "What Was the U.S. GDP Then?". MeasuringWorth. Retrieved January 5, 2018. United States Gross Domestic Product deflator figures follow the Measuring Worth series. Apollo 1, initially designated AS-204, was the first manned mission of the United States Apollo program, which had as its ultimate goal a manned lunar landing. The low Earth orbital test of the Apollo Command/Service Module never made its launch date of February 21,1967. A cabin fire during a launch rehearsal test on January 27 at Cape Kennedy Air Force Station Launch Complex 34 killed all three crew members—Command Pilot Virgil I, Gus Grissom, Senior Pilot Edward H. White II, and Pilot Roger B. 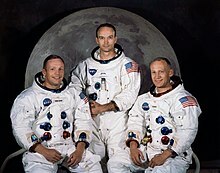 The name Apollo 1, chosen by the crew, was retired by NASA in commemoration of them on April 24,1967. 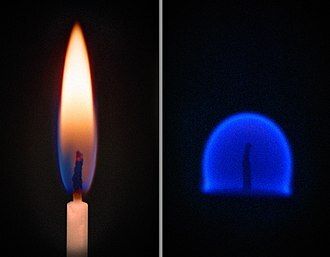 The ignition source of the fire was determined to be electrical, and the fire spread due to combustible nylon material. The astronauts rescue was prevented by the plug door hatch, which could not be opened against the internal pressure of the cabin. A failure to identify the test as hazardous led to the rescue being hampered by poor emergency preparedness and this disclosure embarrassed NASA Administrator James E.
Webb, who was unaware of the documents existence, and attracted controversy to the Apollo program. 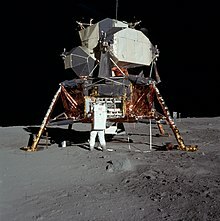 Despite congressional displeasure at NASAs lack of openness, both congressional committees ruled that the issues raised in the report had no bearing on the accident, Manned Apollo flights were suspended for 20 months while the Command Modules hazards were addressed. However, the development and unmanned testing of the Lunar Module, the Saturn IB launch vehicle for Apollo 1, AS-204, was used for the first LM test flight, Apollo 5. The first successful manned Apollo mission was flown by Apollo 1s backup crew on Apollo 7 in October 1968, AS-204 was to be the first manned test flight of the Apollo Command/Service Module to Earth orbit, launched on a Saturn IB rocket. This was incorporated into the Block II CSM design, along with lessons learned in Block I, Block II would be test-flown with the LM when the latter was ready, and would be used on the Moon landing flights. Director of Flight Crew Operations Deke Slayton selected the first Apollo crew in January 1966, with Grissom as Command Pilot, White as Senior Pilot, but Eisele dislocated his shoulder twice aboard the KC135 weightlessness training aircraft, and had to undergo surgery on January 27. The Lunar Reconnaissance Orbiter is a NASA robotic spacecraft currently orbiting the Moon in an eccentric polar mapping orbit. 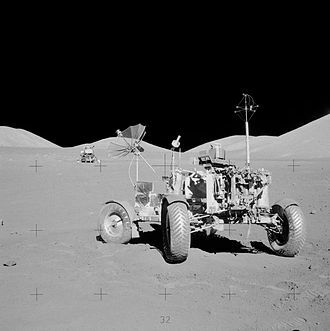 Data collected by LRO has been described as essential for planning NASAs future human and its detailed mapping program is identifying safe landing sites, locating potential resources on the Moon, characterizing the radiation environment, and demonstrating new technologies. LRO and LCROSS were launched as part of the United Statess Vision for Space Exploration program, the probe has made a 3-D map of the Moons surface at 100-meter resolution and 98. 2% coverage, including 0. 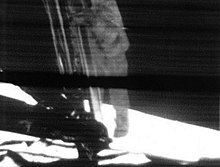 5-meter resolution images of Apollo landing sites. 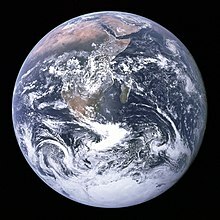 The first images from LRO were published on July 2,2009, the total cost of the mission is reported as US$583 million, of which $504 million pertains to the main LRO probe and $79 million to the LCROSS satellite. Developed at NASAs Goddard Space Flight Center, LRO is a large and its mission duration was planned for one year, but has since been extended numerous times after review by NASA. After completing a design review in February 2006 and a critical design review in November 2006. Launch was planned for October 2008, but this slid to April as the spacecraft underwent testing in a vacuum chamber. 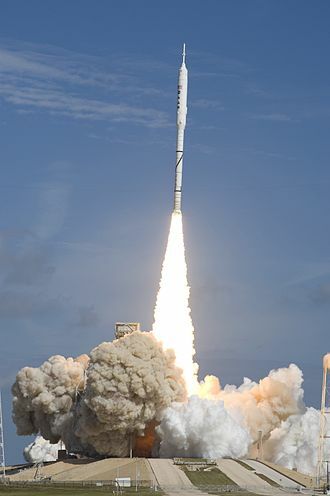 Launch was rescheduled for June 17,2009, because of the delay in a priority military launch, the one-day delay was to allow the Space Shuttle Endeavour a chance to lift off for mission STS-127 following a hydrogen fuel leak that canceled an earlier planned launch. 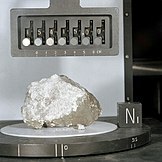 In addition, LRO has provided some of the first images and precise locations of landers and equipment from previous American and Russian lunar missions, Diviner The Diviner Lunar Radiometer Experiment measures lunar surface thermal emission to provide information for future surface operations and exploration. LEND The Lunar Exploration Neutron Detector provides measurements, creates maps, LOLA The Lunar Orbiter Laser Altimeter investigation provides a precise global lunar topographic model and geodetic grid. 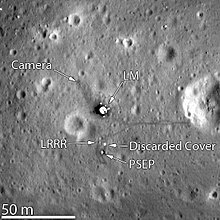 LROC The Lunar Reconnaissance Orbiter Camera addresses the measurement requirements of landing site certification, LROC comprises a pair of narrow-angle push-broom imaging cameras and a single wide-angle camera. 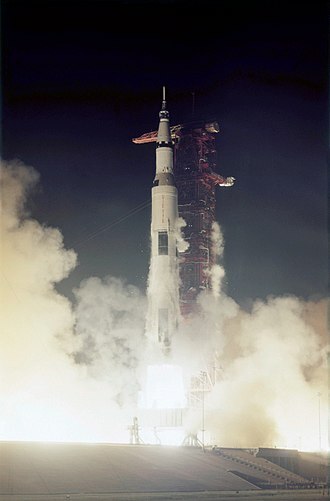 Apollo 6, launched on April 4,1968, was the second A type mission of the United States Apollo program, an unmanned test of the Saturn V launch vehicle. It was the final unmanned Apollo test mission, the flight plan called for following trans-lunar injection with a direct return abort using the Command/Service Modules main engine, with a total flight time of about 10 hours. A phenomenon known as pogo oscillation damaged some of the Rocketdyne J-2 engines in the second and third stages by rupturing internal fuel lines, causing two second-stage engines to shut down early. 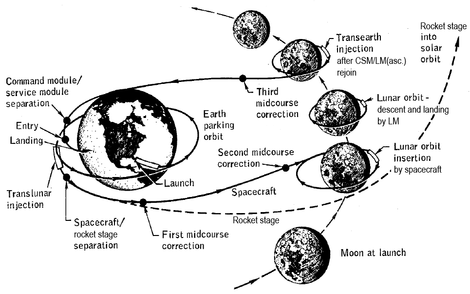 The vehicles onboard guidance system was able to compensate by burning the second and third stages longer, the damaged third stage engine failed to restart for trans-lunar injection. Flight controllers elected to repeat the flight profile of the previous Apollo 4 test, achieving a high orbit, despite the engine failures, the flight provided NASA with enough confidence to use the Saturn V for manned launches. 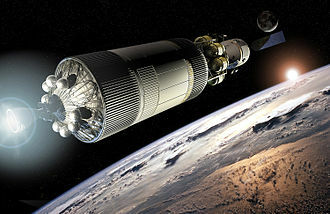 Since Apollo 4 had already demonstrated S-IVB restart and tested the heat shield at full lunar re-entry velocity, Apollo 6 was intended to send a Command and Service Module plus a Lunar Module Test Article, a simulated Lunar Module with mounted structural vibration sensors, into a translunar trajectory. 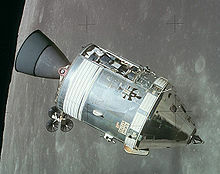 On the return leg, the engine would fire once more to accelerate the craft to simulate the nominal lunar return trajectory with an angle of -6.5 degrees. The entire mission would last about 10 hours, a full lunar mission spacecraft weight was not quite simulated because the LTA-2R weighed 26,000 pounds, only about 80% of a nominal LM. Also, the CSM was only fueled to a weight of 55,420 pounds instead of the lunar mission weight of 63,500 pounds. It was the first mission to use High Bay 3 in the Vertical Assembly Building, Mobile Launcher 2, and Firing Room 2. The S-IC first stage arrived by barge on March 13,1967, the S-II second stage was two months behind them and so was substituted with a dumbbell-shaped spacer so testing could proceed. This had the height and mass as the S-II along with all the electrical connections. It was stacked and mated into the rocket on July 7, testing was slow as they were still checking out the launch vehicle for Apollo 4, a limitation of the system where there wasnt two of everyone and everything. 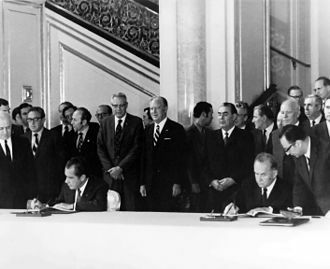 In February 1969, President Richard Nixon appointed a Space Task Group headed by Vice President Spiro Agnew to recommend human space projects beyond Apollo. The systems major components consisted of, a permanent space station designed for 6 to 12 occupants, in a 270-nautical-mile Earth orbit. Modules could be combined in Earth orbit to create a 50 to 100 person permanent station, the tug and ferry vehicles would be of a modular design, allowing them to be clustered and/or staged for large payloads or interplanetary missions. The system would be supported by permanent Earth and lunar orbital propellant depots, the Saturn V might still have been used as a heavy lift launch vehicle for the nuclear ferry and space station modules. A special Mars Excursion Module would be the remaining vehicle necessary for a human Mars landing. Based on this, Nixon rejected all parts of the program except the Space Shuttle which inherited the STS name, as funded, the Shuttle was greatly scaled back from its planned degree of reusability, and deferred in time. The Shuttle first flew in 1981, and was retired in 2011, a second part of the system, Space Station Freedom, was approved in the early 1980s and announced in 1984 by president Ronald Reagan. However, this became politically unviable by 1993, and was replaced with the International Space Station. The ISS was completed in 2010, the space has a propulsion and cargo modules. Report of the Space Task Group,1969, the Space Shuttle Decision, NASAs Search for a Reusable Space Vehicle. Washington, DC, National Aeronautics and Space Administration,1999, the Space Shuttle Decision, NASAs Search for a Reusable Space Vehicle. Washington, DC, National Aeronautics and Space Administration,1999, NASA Report, Technical Study for the Use of the Saturn 5, INT-21 and Other Saturn 5 Derivatives to Determine an Optimum Fourth Stage. Volume 1, Technical Volume, Book 1, Web Address when accessed, http, //ntrs. nasa. gov/archive/nasa/casi. ntrs. nasa. gov/19810065609_1981065609. pdf Dewar, to The End Of The Solar System, The Story Of The Nuclear Rocket, December 2003. 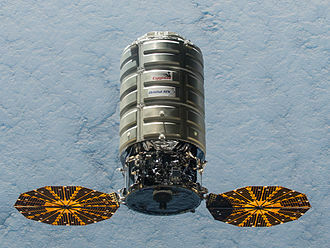 The Pioneer program is a series of United States unmanned space missions that were designed for planetary exploration. There were a number of missions in the program, but the most notable were Pioneer 10 and Pioneer 11. Pioneer 10 and Pioneer 11 carry a golden plaque, depicting a man and a woman and information about the origin and the creators of the probes, should any extraterrestrials find them someday. 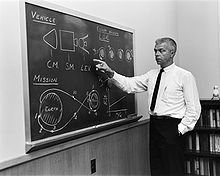 Credit for naming the first probe has been attributed to Stephen A. Saliga, while he was at a briefing, the spacecraft was described to him as a lunar-orbiting vehicle with an infrared scanning device. Saliga thought the title too long and lacked theme for an exhibit design, the earliest missions were attempts to achieve Earths escape velocity, simply to show it was feasible and study the Moon. This included the first launch by NASA which was formed from the old NACA and these missions were carried out by the US Air Force and Army. 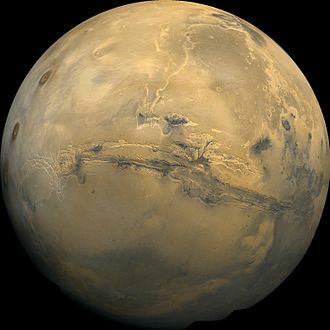 Most missions here are listed with their most recognised name, while successful, the missions returned much poorer images than the Voyager program probes would five years later. The project was developed from several early Air Force and NASA concepts of manned space stations to be used for reconnaissance purposes. MOL evolved into a laboratory, with which crews would be launched on 40-day missions and return to Earth using a Gemini B spacecraft. 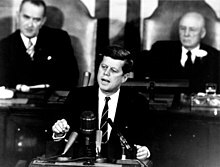 The MOL program was announced to the public on 10 December 1963 as a platform to prove the utility of man in space for military missions. 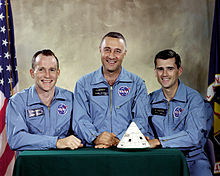 Astronauts selected for the program were told of the mission for the program. The contractor for the MOL was the Douglas Aircraft Company, MOL was cancelled in 1969, during the height of the Apollo program, when it was shown that unmanned reconnaissance satellites could achieve the same objectives much more cost-effectively. U. S. space station development was pursued with the civilian NASA Skylab which flew in the mid-1970s. In the 1970s, the Soviet Union launched three Almaz military space stations, similar in intent to the MOL, but cancelled the program in 1977 for the same reasons, the MOL was planned to use a helium-oxygen atmosphere. It used a Gemini B spacecraft as a reentry vehicle, the crew were to be launched using a Titan 3M with the stacked Gemini B and MOL, and returned to Earth in the Gemini B. They would conduct up to 40 days of military reconnaissance using large optics, the USAF Astronaut Maneuvering Unit was developed for the MOL project. In response to the announcement of the MOL, the Soviet Union commissioned the development of its own space station. 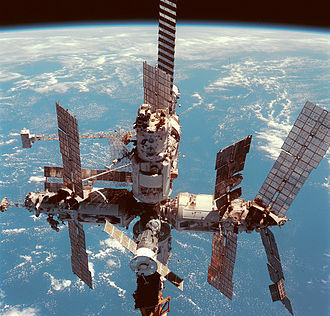 Three Almaz space stations flew as Salyut space stations, and the program developed a military add-on used on Salyut 6. Externally it was similar to Gemini, but featured a rear hatch for the crew to enter MOL, Gemini B would be launched with the MOL space station. 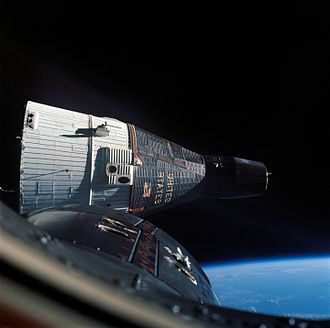 Once in orbit, the crew would power down the capsule, after about one month of space station operations, the crew would return to the Gemini B capsule, separate from the station and perform reentry. Test flight OPS0855 for MOL was launched on 3 November 1966 at 13,50,42 UTC on a Titan IIIC-9 from Cape Canaveral Launch Complex 40. The Mercury-Redstone Launch Vehicle, designed for NASAs Project Mercury, was the first American manned space booster. It was used for six sub-orbital Mercury flights from 1960–61, culminating with the launch of the first, and 11 weeks later, the four subsequent Mercury human spaceflights used the more powerful Atlas booster to enter low Earth orbit. Therefore, this Jupiter-C first stage was used as the point for the Mercury-Redstone design. Hans Paul and William Davidson, propulsion engineers at ABMA, were assigned the task of modifying the A-7 to be safe and reliable for manned flights. During 1959, most of ABMA were preoccupied with the Saturn project, as a starting point, the most obvious step was getting rid of its staging capability as the Mercury-Redstone would not utilize upper stages. Many of the more advanced Jupiter-C components were removed for reliability reasons or because they were not necessary for Project Mercury. This was a more fuel than ethyl alcohol, but it was more toxic. Furthermore, hydyne had never used with the new A-7 engine. The Mercury-Redstone designers rejected hydyne and returned to the ethyl alcohol fuel. The lengthened propellant tanks were necessary in lieu of using less powerful fuel. The most important change in making the Mercury-Redstone a suitable vehicle for an astronaut was the addition of an automatic abort sensing system. Either the astronaut or the ground controllers could initiate an abort manually, the Mercury-Redstones automatic in-flight abort sensing system solved this problem by monitoring the rockets performance during flight. 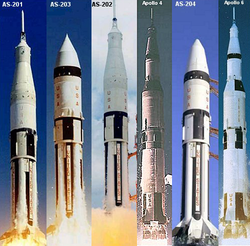 Review of flight data from the more than 60 Redstone and Jupiter C launches since 1953 was used to analyze the most likely failure modes of this launch vehicle family. In the interest of simplicity, the sensing system had to be kept as simple as possible. 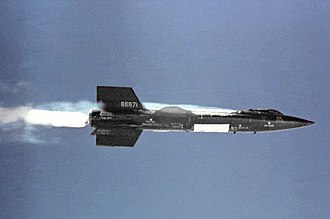 Instant abort capability was important because certain failure modes such as loss of thrust upon liftoff could result in a catastrophic situation. The most visible difference between the Jupiter-C first stage and the Mercury-Redstone was in the section just below the Mercury capsule and this section was known as the aft section, a term which was inherited from the military Redstone. A space capsule is an often manned spacecraft which has a simple shape for the main section, without any wings or other features to create lift during atmospheric reentry. 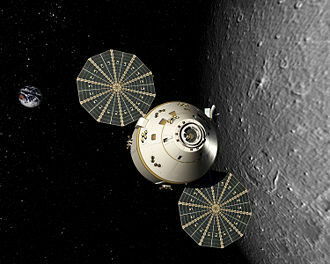 A capsule is the form for the Orion Multi-Purpose Crew Vehicle. A manned space capsule must have everything necessary for life, including air, water. The space capsule must protect astronauts from the cold and radiation of space, a capsule must be well insulated and have a system that controls the inside temperature and environment. It must have a way that the astronauts would not be knocked around during launch or reentry, since the inside will be weightless, there must be a way for the astronauts to stay in their seats during the flight. For this each seat has a system of straps and buckles, one of the most important things that a space capsule must have is a way to communicate with people back on Earth, or mission control. Space capsules have typically been smaller than 5 meters in diameter and this has been especially pronounced in the case of the Soyuz manned spacecraft. Most space capsules have used a heat shield for reentry. The Orion Multi-Purpose Crew Vehicle appears likely, as of December 2005, there is no limit, save for lack of engineering experience, on using high-temperature ceramic tiles or ultra-high temperature ceramic sheets on space capsules. Materials for the capsule are designed in different ways, like the Apollo Command Module’s aluminum honeycomb structure. Aluminum is very light, and the gives the space capsule extra strength. The early space craft had a coating of glass embedded with synthetic resin, carbon fiber, reinforced plastics and ceramic are new materials that are constantly being made better for use in space exploration. Space capsules are well-suited to high-temperature and dynamic loading reentries, the current RKK Energia design for the Kliper, being capable of flights to Mars, is an exception. Engineers building a space capsule must take such as gravity. The space capsule must be enough to slow down quickly, must endure extremely high or low temperatures. LC-34 today. The plaque (below) is on the rear of the right column.